New Delhi, 17 June 2017: The Union Minister of State (Independent Charge) Development of North-Eastern Region (DoNER), MoS PMO, Personnel, Public Grievances & Pensions, Atomic Energy and Space, Dr Jitendra Singh visited the office premises of Department of Administrative Reforms and Public Grievances (DARPG) here today, to review the implementation of the Swachhta Action Plan. The DARPG and Department of Pension and Pensioners’ Welfare are observing the Swachhta Pakhwada from 16th-30th June, 2017. On the occasion, Dr. Jitendra Singh complimented both the Departments for undertaking various Swachhta related activities during this Pakhwada and also expressed happiness that the two Departments are working together as one team. He said that the habit of cleanliness should be practised by all and it should be the responsibility of everyone to keep their surroundings clean. Highlighting the steps taken by DARPG, he said that 25 Ministries/ Departments will be turned into e-office by the end of this month. He also said that there has been an increase of a whopping 6000%, in the number of e-files with 4,62,000 e-files generated in 2017, compared to 8,000 e-files last year. Dr Jitendra Singh said under the guidance of Prime Minister Shri Narendra Modi, the Departments are committed to provide maximum Governance to the public. He said that the process involved in the Civil Services Day has been completely transformed by DARPG in the last three years, as the participation and involvement of stakeholders has increased many folds. He said that DARPG is seen as the HR department of the Government of India. All good practices originate from this Department, he added. The Minister said that an MoU between India and Portugal on Cooperation in the field of Public Administration and Governance Reforms has been recently approved by the Cabinet. Dr Jitendra Singh expressed happiness over the fact that there has been near 100% disposal of grievances under Centralized Public Grievance Redress and Monitoring System (CPGRAMS) and 50% of the feedbacks received under Centralized Pension Grievance Redressal and Monitoring System (CPENGRAMS), have expressed satisfaction on their grievance redressal. Secretary, DARPG Shri C Viswanath said that Modernisation and Swachhta go hand in hand and the allocation for DAPRG Modernisation has been doubled compared to last year. He said that the Department has implemented 100% e-office with digitisation of records. He also said that 58 Central Ministries/Departments and 33 States and UTs have abolished affidavits and attestation. He highlighted the various activities being undertaken by the Department during the Swachhta Pakhwada. The DARPG is undertaking various activities like recording, reviewing and weeding out of old records, digitization of records, disposal of old and obsolete items etc. A poster(s)/ slogan competition has also been organised on the theme of Swachha Bharat. The best workstation will also be declared in the Department and appreciation certificate will be awarded to the winner. The Department has also planned to utilise Rs 10 lakhs for Swachhta related activities in the department during the current financial year. The Department of Pension & Pensioners' Welfare is also undertaking similar activities during this Pakhwada. Senior officers of the DARPG and Department of Pension & Pensioners' Welfare were also present on the occasion. 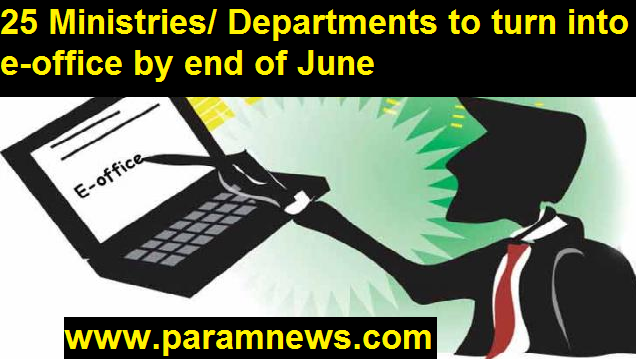 25 Ministries/ Departments to turn into e-office by end of June, says Dr. Jitendra Singh E-files increased from 8,000 to 4,62,000, says MoS (PP) The DARPG is undertaking various activities like recording, reviewing and weeding out of old records, digitization of records, disposal of old and obsolete items etc. The DARPG and Department of Pension and Pensioners’ Welfare are observing the Swachhta Pakhwada from 16th-30th June, 2017.